This is probably a bit premature, given that the ExpressLanes project has targeted opening dates of late 2012 for the 110 freeway segment and early 2013 for the 10 freeway. But L.A. Streetsblog on Thursday had a good post about these charts about transponder fees, so I also wanted to publish them here. First, the basics. 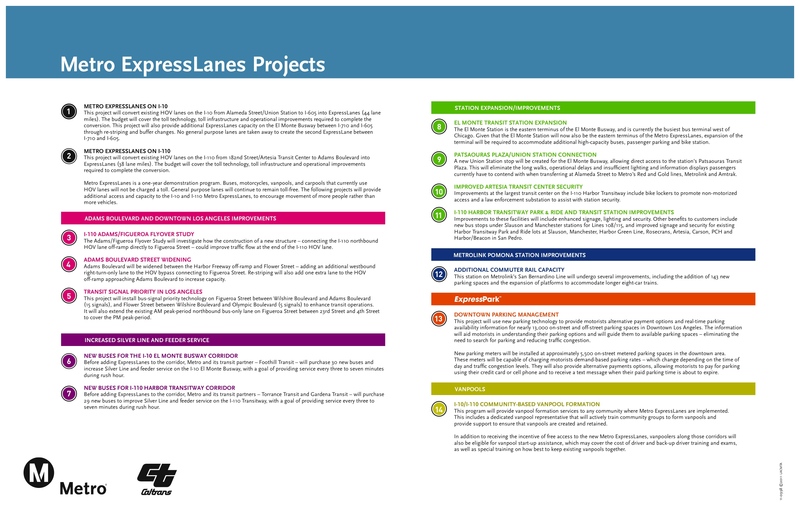 The ExpressLanes project is converting carpool lanes on segments of the 10 and 110 freeways to congestion pricing lanes, also known as “HOT lanes” or “variable toll” lanes. The pilot program — funded mostly by the federal government — aims to increase speeds on the entire freeway in exchange for some motorists paying to use extra space in the toll lanes. With two toll lanes in both directions, bus service will also be beefed up and should be quicker. On the 10, the ExpressLanes will begin just east of downtown Los Angeles and run to the 605 freeway. Vehicles with three or more occupants will continue to use the lanes for free while vehicles with two occupants will pay a toll during peak hours but use the lanes free otherwise. On the 110 freeway, the lanes will be from just south of downtown L.A. to the Artesia Transit Center. All vehicles with two or more occupants will use the lanes for free. There are also a number of other improvements planned. Please see the map and chart at the end of the post. 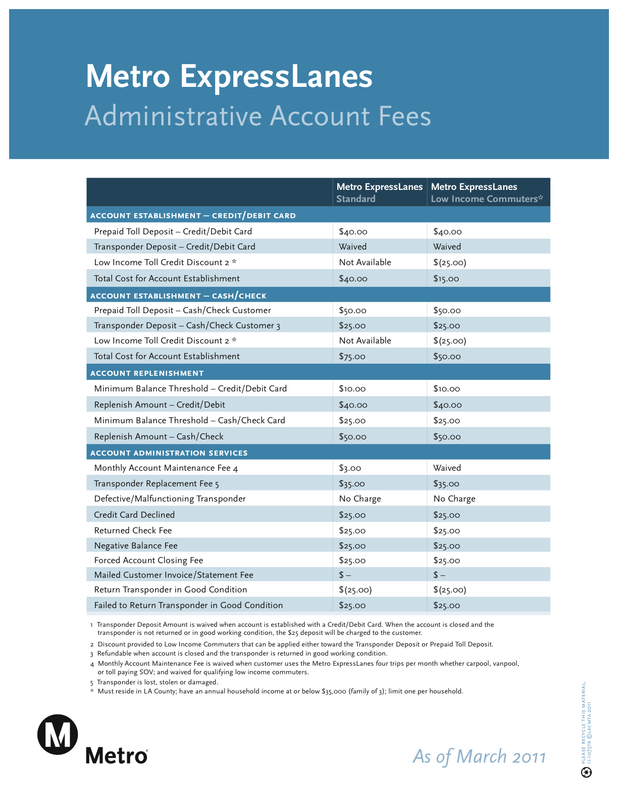 As for the above chart, it shows the deposits, fees and minimum balances that Metro customers must pay to get transponders to use the lanes. Not exactly exciting stuff. The big takeaway from the chart is that it shows that as currently planned, Metro’s fees are in line with other regions that use transponders to track tolls. The real bottom line: for many commuters (i.e. credit card users), it will cost $40 to open an ExpressLanes account and get a transponder, with the $40 going toward tolls. 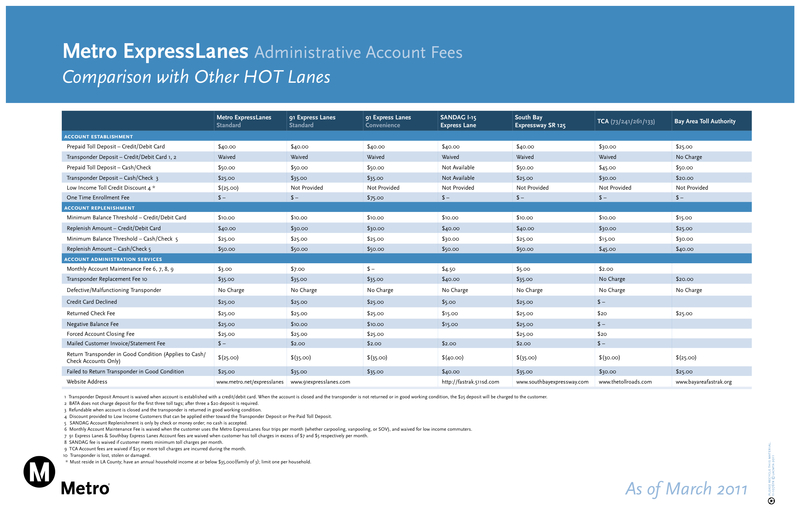 The second chart, shown above, lists the variety of fees that ExpressLanes may or may not encounter depending on how they pay (or — whoops! — don’t pay) for tolls. What exactly are transponders? They’re small, square devices that stick to the inside of a vehicle’s windshield and electronically track when vehicles must pay a toll. Why is this important? Because all vehicles must have a transponder to use the ExpressLanes. There won’t be toll booths — just electronic devices at regular intervals on the freeway that determine when a vehicle should be charged a toll via its transponder. Toll booths, of course, stop traffic while the numbskull in front of you looks for change under his floor mat. Transponders keep traffic m-o-v-i-n-g.
And where do commuters get the transponders? As noted in this recent Metro staff report, “commuters will be able to receive a transponder by opening an account online, over the phone, or at walk-in centers.” [UPDATE: Motorists who have an existing FasTrak transponder used on other toll roads in California do not need to get a new one to pay the toll on the Metro ExpressLanes]. In addition, the Metro Board’s ad hoc congestion pricing committee is scheduled next week to consider a promotional effort that would allow commuters to get discounted transponders from AAA. Here’s the report [pdf]. If this all sounds very complicated, it’s not. The transponders are used in many other regions with toll lanes. Closest to home, they’re used on the 91 Express Lanes in Orange County and they’re also used in the Bay Area, where tolls are quite common. One other neat trick: the transponders will have a switch on them allowing motorists to “declare” how many people are in their vehicles. There will also be photo enforcement cameras and CHP officers to help catch those who dare use the lanes without a transponder. Tolls on the ExpressLanes will vary between 25 cents and $1.40 per mile, depending on the level of traffic. When there’s a lot of traffic, the tolls will be higher to discourage too many motorists from using the congestion pricing lanes. The hope is that this supply-and-demand pricing will allow speeds in the toll lanes to remain at 45 mph or higher — which isn’t always the case in carpool lanes around L.A. County. For tons more info on the project, I recommend checking out this FAQ on the project’s web page [pdf]. And below are a map of the project and a list of the many other improvements being made in the 10 and 110 corridors. Non-LA Metro issued FasTrack transponders, such as those from the Bay Area or San Diego or Orange County, do not have a switch on them. What will prevent users of those transponders from getting charged every time they use I-10 or I-110? Good question and I’ll try to get an answer. I’m not sure that transponders from different regions work everywhere — i.e. not sure the 91 Express Lanes can read transponder from Bay Area. As for the lanes here, everyone has to have transponder to use the lanes. As for the switch, it is used to communicate how many people are in the vehicle at the time. I think the fees collected from HOT lanes should go towards improving & establishing service on trains and light rail. The objective is to encourage more usage of mass transit. There was recently an article in the OCR about people who were being charged twice when on the toll roads in OC. One guy forgot about a second transponder in his glove compartment so every time he used the toll road he was charged twice. The article reported another person who had a similar experienced. This was a project promoted by the previous Bush administration as part of its “anti-mass transit” attitude. I have never believed the MTA nor Mayor V. (who was active in getting tons of $$ in exchange for building these toll roads) really wants this to succeed. These toll roads are a demonstration project ONLY, and after the demonstration period, Metro can take them down and put them back to general use or other mass transit use if it wants. Why did Mayor V. and the MTA actively work to get this plan? Because, as an incentive, it came with millions of $$ with no obligation to be spent on the HOV demonstration project. I have to say that the MTA and Mayor V. were smart to dance to the Bush Administration’s tune because they have millions to spend on whatever they want for the small price of HOV lanes for the affluent. In the end, Metro can return these lane back to ANY motorists with minimum passengers at NOT COST to use. I forgot to add that one of the reasons I think Mayor V. doesn’t really want this to succeed is that the HOV pay lanes for the affluent are truly REGRESSIVE mass transit options that the Mayor and even the MTA has never liked. The 91 FastTrack has its controversies and other toll roads in the OC are barely making it financially. The pay HOV concept just doesn’t work except for those who need transit the least, and stated benefits are apocryphal at best. Forcing people that car pool to acquire a transponder seems like a failing model. Sure it might be sensible for commuter car poolers (which who’s numbers have been going down), but for casual car poolers like myself who use it on the weekends with the family, it doesn’t make sense to invest in one. So what happens is weekend traffic will suffer and you will have empty “HOT” lanes during that time. Car Pooling should be on the honor system like it is now. If someone wants to use the carpool lane alone they are subject to a heavy fine. What is the difference? It appears that the construction to add lanes on I-10 is winding down. Are there plans to open the extra carpool lane for 3+ use before the Expresslanes go into service, as it is already pretty congested during commute hours? 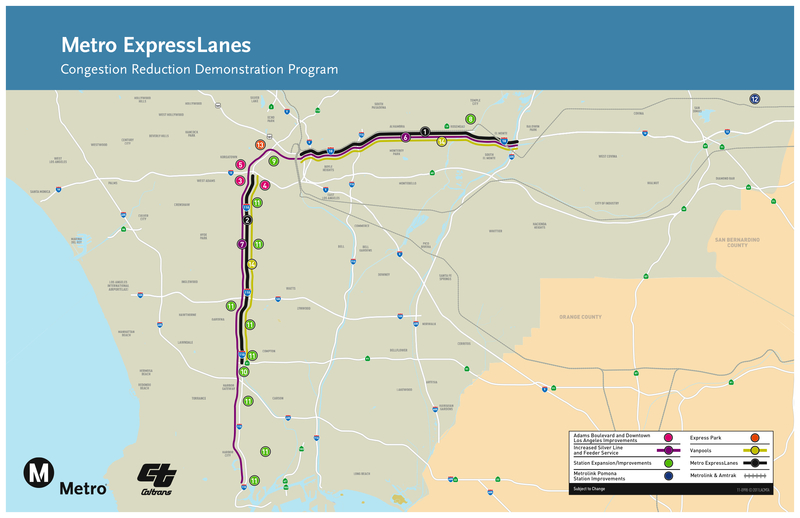 The work currently being done on the I-10 freeway is not for the ExpressLanes project. It is a separate highway improvement project being done by Caltrans to improve various on and off ramps along the corridor and re-surface the corridor, and has been under way for a couple of years now. It is scheduled for completion early next year. There are no plans to open the extra carpool lane for 3+ use before the ExpressLanes go into service. I do not use the Expresslanes 4 times per month, but when I do drive on the 110 or 10 I always have a carpool. To maintain the privilege of following the rules, I will have to deposit $40 onto a transponder that I will never use for tolls, then pay a $3.00/month account maintenance fee just in case I ever want to travel in the Expresslanes. Imagine if Metro encouraged casual riders to get TAP cards by charging a maintenance fee. The legislature long ago outlawed maintenance fees on stored balance (gift) cards–why is the government exempt from its own rules? The sad thing is that the Bay Area fee structure eliminates the problem. Their goal is for everyone to get a transponder–even the most casual of bridge users–because they correctly recognize that it’s easier and cheaper for everyone in the long run. With no maintenance fee, you never have to worry about it. You just keep it in your car and top it off whenever the balance gets low. Why can’t LA learn from the Bay Area? Fair points about getting transponders to many users. That said, I do think the fee structure is not overly burdensome to most people who will be interested in using the lanes. I do think it’s worth noting that the maintenance fee is waived to ANYONE who uses the carpool lanes four times a month, even those who don’t have to pay tolls because they’re carpooling. So most regular and even some irregular users of the lanes won’t have to pay. As for the transponders, Metro’s $40 deposit is waived for those who use credit cards to make the deposit — the $40 is a prepayment on tolls that will be incurred. The Bay Area does the same thing, but it’s $25 there. Obviously carpoolers who now use the lanes for free and without transponders will have to go get them. That said, it may well be worth it: the 10 freeway segment will have an additional carpool lane in both directions, there will be more transit in the corridor and speeds in the carpool lanes may improve. It’s a one-year test program, so we’ll see. But I think it’s well worth trying. I’ve owned a FasTrak transponder since 2002 and used it on every toll road/facility in the State. I bought the transponder when I lived in San Diego, used it on the OC expressways, and used it in San Francisco on the bay bridge. I still take it with me when driving from LA to OC or SF. Just learned that the Santa Clara Valley TA will not require transponders for carpoolers. I don’t think that SANDAG requires them for HOV 2+ use on their I-15 project. Both of these projects are in the State of California. So why is LA Metro not following this model? Is Metro using the SAME Fastrack system as OC/SD/Bay Area? It wasn’t clear from the article that this is the case. If so, I think you should mention that people who already have Fastrack would not have to get a new transponder. If not, then why not??? Motorists who have an existing FasTrak transponder do not need to get a new one to pay the toll on the Metro ExpressLanes. I’ll add that to the post to clarify — I’m guessing others will have the same question. Thanks for reading and asking! What about Hybrids with the stickers? What will happen to them? How will this work for those who are non-natives of Los Angeles who are driving rental cars? Or say, a family from Nevada driving this freeway? I ask this because I got the same headache riding on the President George Bush Highway in Dallas/Ft. Worth area and had to literally fight the guys in Texas over the phone for a collections call for $5.00 toll now becoming $300 in fines for driving a rental car without a tag, in which the rental car agency assured that it’ll just be billed to my credit card (never did). And again, missing out the motorcyclist who share the freeway. How does a person on a Harley or Triumph who can legally use the carpool lane be subjected to the photo enforcement?